How many of you have ever needed a lawyer at least once in your personal or professional life? Well, as you know, your lawyer can be your best friend when he agrees with what you have done. Or he can be your worst scold when you mess up. Ned has been really busy lately, really busy! But whatever, he is our lawyer. He has been our lawyer for more years than most of us can remember (actually since February of 1979), and like all fellow ALPCA members he is "family". Ned was born October 20, 1945 and joined ALPCA in 1975. Ned received his bachelor's degree at Yale where many world famous leaders have been schooled. He was one year ahead of President George W. Bush. Ned served in the United States Air Force and saw the world. How do you think he got all those plates? In 2010 Ned took on another club task as National convention chairman. How many jobs does one man need? Husband, parent, lawyer, Ivy League alumnae, veteran, plate collector, traveler, former Pennsylvanian, current New Yorker; the list is endless. In addition to all of this Ned is a great guy, a good collector, and a true booster and builder of the club. For many years Ned hosted one of the most fun meets of all, high up in Pennsylvania's Pocono Mountains, where he had grown up and lived forever before meeting his bride and moving away. Ned has been by our side and at our backs throughout; in situation after situation, always providing wise and steady counsel; supplying a service that is vital to managing a corporation like ALPCA. But he has always been in the background of things, never complaining, never seeking credit or recognition and best of all -- NEVER BILLING! (As far as I know). I could go on and on but I'll stop since I know Ned will be his humble self and correct any mistakes reported herein. Respected collector and fellow Hall of Fame member Verdon Rustine calls him a square dealer and true mentor to all who seek him out. What better testimonial could one ask for? 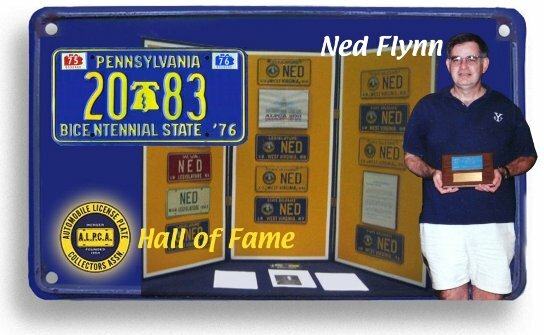 Welcome to the Hall of Fame Ned Flynn.